Throughout 2017 STWR continued to strengthen and promote our case for global economic sharing, particularly in relation to our core advocacy position as an organisation. All of our work related to the need for a united people’s voice that speaks on behalf of the least advantaged, giving the highest priority to the prevention of extreme human deprivation across the world. This was reflected in our new publications, website materials and grassroots activities that revolved around the cause of implementing Article 25 of the Universal Declaration of Human Rights. Much of our work during the year also concerned our far-reaching perspective on how to achieve a universal basic income, as part of our broader vision of guaranteeing basic socioeconomic rights for all. Moving forwards into 2018, STWR will step up our campaigning activities under the banner of Article 25, while expanding the more philosophical and spiritual aspects of our work through further book publications and educational resources at sharing.org. From the perspective of a civil society organisation that campaigns for a fairer sharing of the world’s resources, international political events during 2017 appeared to be far from optimistic. Early in the year, the United Nations reported that it was facing the largest humanitarian crisis since the second world war, with the threat of famine breaking out in many war-torn and impoverished regions. Critical funding needs had never been higher, yet government pledges of aid and finances remained far short of UN appeals. Official statistics on world hunger again began to rise, while the global refugee crisis continued to increase in magnitude to record levels. At the same time, various studies revealed how the richest 0.1% of the world’s population were increasing their combined wealth at the expense of the majority poor, leading to a ‘new gilded age’ of staggering proportions. Almost all the reporting from progressive media outlets pointed to a deterioration in world trends, from the failure of governments to adequately address the climate crisis to the exposed scandal of global tax evasion and illicit capital flight from developing countries, among many other issues. A main function of STWR’s website and online social networking activities in 2017 served to highlight this worsening reality of extreme poverty, global inequality and environmental degradation. We continued our approach of publishing guest content when it emphasises the crisis of our growingly divided world, or when it reflects the theory and practice of economic sharing. For the time being, this content helps to give visitors to the website a sense of our priorities and outlook as an organisation, while also providing a useful resource for progressive campaigners and researchers. Our own articles, blogs and publications throughout the year more directly emphasised the case for global economic sharing, particularly in relation to STWR’s basic advocacy position. All of our resources and materials were in some way related to the need for a united people’s voice that speaks on behalf of the least advantaged, giving the highest priority to the prevention of extreme human deprivation in every country. 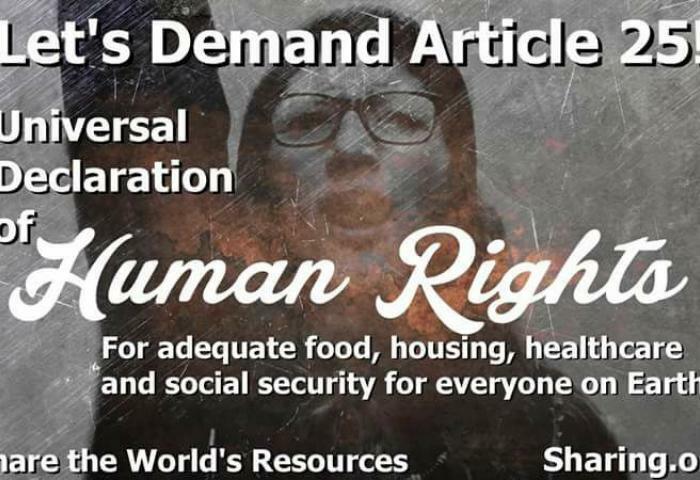 This included our newsletter editorials that further expounded our ‘people’s strategy for world transformation’ based on heralding Article 25 of the Universal Declaration of Human Rights. For example, we called for a huge resurgence of the spirit that animated Occupy protests from 2011, but now focused on the worsening reality of mass starvation in many parts of Africa and the Middle East. Through the same lens, we also examined proposals from prominent thinkers for a great transition to a sustainable and equitable world, and we variously articulated the new awareness that must inform a less commercialised and more sharing-oriented mode of living. Much of STWR’s new content was translated and featured on our shadow Japanese website (www.sharing.org/ja), which has developed into a valuable repository of our publications and selected guest content. Visits to the Japanese site are steadily increasing, both directly through search engines and via our Japanese Facebook page where relevant work is reposted. All of the work completed to date under the umbrella of ‘studies on the principle of sharing’ have now been translated into Japanese, enabling us to print several Japanese versions of our books in the future. The heart of our work this past year has revolved around the series of studies by STWR’s founder, Mohammed Mesbahi. These unique publications provide a visionary insight into STWR’s aims and purposes as a campaign organisation, and our core team of staff have been keenly involved in the production, publication and marketing of Mesbahi’s ongoing book releases. With the help of our co-workers, all of the publications to date have also been translated into Japanese, German and several other languages. We first published a new book in April, titled ‘The commons of humanity’, which examines the meaning and significance of the commons from the ‘inner’ or spiritual perspective, as well as from the conventional ‘outer’ perspective that is widely promoted today by many contemporary thinkers and progressive political groups. The book was printed in a clothbound limited edition for the time being, although a digital version was also made freely available on our website and Medium page, and communicated widely. It received some positive reviews, as well as an appreciative personal letter from the office of Prince Charles. A second book was published in September 2017 on the subject of a universal basic income (UBI), which is an increasingly popular policy proposal that Mesbahi examined from a more holistic and spiritual perspective. Titled ‘Towards a universal basic income for all humanity’, the book elucidates a people’s strategy for achieving a truly ‘universal’ vision of a UBI, based on the preceding cause of heralding Article 25 in continuous mass demonstrations across the world. Written in an accessible and cogent format, the book incorporates strategic advice for serious proponents within the basic income movement, and a number of explanatory and contextual endnotes were included to help clarify STWR’s standpoint on some of the more policy-related issues. Much of our organisational activity during the year hinged on promoting our far-reaching vision of a UBI, which was also reflected in various of our website publications. This included some guest content that analysed the potential of a UBI in terms of eradicating poverty and guaranteeing basic socioeconomic rights, as well as featured transcripts of various presentations we gave throughout the year (see below). As mentioned previously, the main focus of our outreach work in 2017 involved promoting STWR’s vision of a universal basic income (UBI) as an essential policy instrument for eliminating material deprivation. A number of campaigners now endorse a UBI along these lines as a global solution for extreme poverty and inequality, hence STWR began to investigate the subject and explore its relevance to our fundamental vision of ‘heralding Article 25’. Over the course of the year, we participated in various events on the subject of a UBI and presented STWR’s vision, including at the World Basic Income conference in Manchester, UK, and the 17th Congress of the Basic Income Earth Network (BIEN) held in Portugal. Attending these gatherings of scholars and activists enabled us to publicise our information at stalls, as well as conduct presentations of our own at side events or within the main conference discussions. Due to the growing popularity of the UBI proposal in its different forms, we found that it provides a useful segue into discussing the broader vision of guaranteeing basic socioeconomic rights for all through a new form of peaceful mass protest movement. A number of small events to local groups across the south of the UK were organised by our staff and co-workers on the subject of a UBI and its relevance to Article 25, which generated a lot of positive feedback. Due to the success of this format of talks, we will continue to promote our vision of a UBI in relevant meetings and events in the UK throughout 2018. In the longer term, however, we plan to focus more directly on STWR’s ideas and proposals in our grassroots activities, conference presentations and talks to interested groups. Our initial ‘Global call for sharing’ campaign is still a useful tool for gathering new support for STWR through sign-ups on our dedicated page, which continues to draw attention alongside our report on ‘Sharing as our common cause’. We intend to keep this campaign page running on the website as a simple means for raising awareness of the broad idea of economic sharing, although our attention is shifting to campaign activities around our flagship publication on Article 25 and the completion of our core series of print publications, as outlined further below. We outlined above STWR’s increasing focus on promoting our case for spontaneous, peaceful and ceaseless protest activity on behalf of the needs of everyone who lacks an adequate standard of living, particularly the very poorest people in less developed countries worldwide. As aforesaid, that central aim has never been more critical and urgent in the midst of an unprecedented global humanitarian crisis, with escalating hunger and human displacement due to entrenched conflicts, extreme poverty and climate change. While STWR remains a small organisation with limited support from the wider public at the present time, we aim to do all we can to promote our cause for heralding Article 25—through website and print publications, social networking, interviews and attending relevant events and demonstrations. We have many ideas for new ways we can promote our message, which we seek to initiate going forwards in tandem with our other activities. For example, we plan to create a campaign video that highlights our case for heralding Article 25, and we intend to compile many new website resources that are specifically dedicated to this cause. A key source of inspiration in these endeavours will be an upcoming book by Mohammed Mesbahi that explicates in greater detail the case for continuous mass demonstrations along this line (see below), which will help to deepen the more spiritual understanding of our campaign vision and provide further guidance for activists. We have also begun the process of organising demonstrations, albeit in a preliminary manner by participating in relevant protest events in the UK where STWR is located. It is hoped that, in time, our ongoing activities will help to inspire other activist groups to begin their own demonstrations and direct actions under the banner of Article 25. The writing work that has formed the backbone of STWR’s campaigning vision and philosophy will continue in 2018, with the aim of publishing at least two further books in the series. The first new book tackles the challenging subject of world governance, taking the form of an interview in its initial chapters (similar to a previous work on climate change), before expanding into a far-reaching philosophical and spiritual exploration of how a truly democratic structure of world governance can emerge and be sustained in the 21st century. This is STWR’s most ambitious book project to date which began in its research phase towards the end of 2017, and it is planned for completion by mid-2018. The second book that we plan to publish in the second half of 2018 relates to the more spiritual case for Article 25 demonstrations as mentioned above, and will contain comprehensive information regarding the ‘inner side’ of the strategy for coordinated worldwide protests. Much of the research has already been compiled for this book, which will be written in the form of a dialogue that ranges from discussion of contemporary political issues to profounder spiritual questions and subject matter. In addition to these two books, it is also hoped that we can publish some of the existing studies by Mesbahi that have yet to be professionally designed and printed, which are currently four in number—namely the treatise on the commons, the environmental crisis, the sharing economy and the highest political vision of a universal basic income. Furthermore, there are many shorter pieces that Mesbahi has authored over recent years which we intend to increase in number and compile into a final book. There are also many translated versions of these books that are ready for print publication, when time and resources permit. We will continue to improve STWR’s website as an educational resource for a diverse audience, ranging from concerned citizens to political activists and development professionals. In this vein, we will carry on publishing external content throughout the year that relates to the case for sharing world resources (i.e. good quality articles, civil society reports and campaigns), alongside our own blogs, editorials and materials. An STWR newsletter will be sent out to our email subscribers on a regular basis, highlighting new material and any current activities. The resources on the Japanese website will also be increased throughout the year, mirroring the English language website as much as possible with translated versions of pertinent material. At some point during the year, we also have plans to redesign elements of the website (as stated above), in order to emphasise our focus around ‘Article 25’ and rejuvenate the look and feel of www.sharing.org.